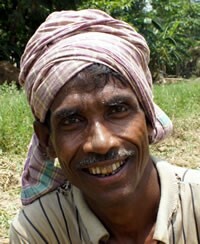 The Matia (or Matya) people are a tribal group which have long been farmers. They are subdivided into three sub-groups, which are divided into clans, which are further divided into lineages. The lineages regulate marriage alliances. They prefer first cousins as marriage partners. 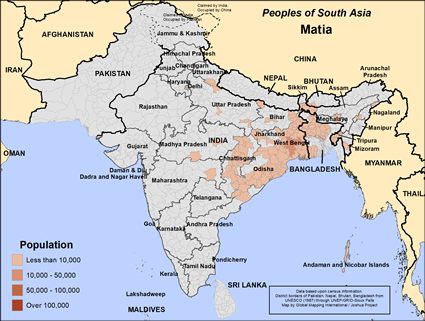 Most of the Matia people live in eastern India, but a smaller number are in Bangladesh. Literacy rates are low, so jobs that involve a good education are not available to most of them. Most are farmers. The Matia people are Hindus. In addition to Hindu gods, the Matia worship the village deity Thakurani and celebrate the festivals Dhunauakhia and Dual Dei. Please pray for improved literacy rates, for better medical care, and for an improved standard of living for this community. Pray especially for the youth to have better access to schools and for parents to make schooling a priority for their children. * Pray for a "Book of Acts" type of movement to Christ among the Matia. * Pray for the Matia people to understand and embrace that Jesus wants to bless their families and neighborhoods. * Pray for Holy Spirit anointed believers from the Matia people to change their society from within. * Pray for a movement of Jesus to heal and strengthen Matia communities.View Matia in all countries.